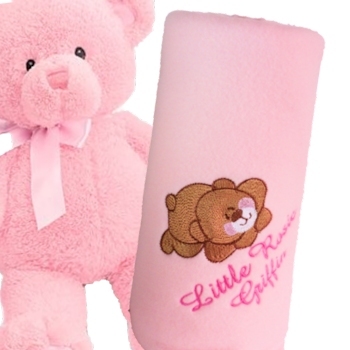 Super soft touch polar fleece baby blanket in pretty pink that you can choose to have personalised with an embroidered name, monogrammed initials or a little message. You may choose to have an embroidery motif added for a small additional charge, tick the Yes option for an embroidery motif. We have many embroidery designs to choose from. You may choose to have an embroidery motif added for a small additional charge, tick the Yes option for an embroidery motif. We have many embroidery designs to choose from. Please click the big green link under the picture to view these and make your selection. This beautiful soft babys blanket is quality made from anti-pil polyester polar fleece fabric with overlocked stitched edges and is lovely to touch and cuddle into. Choose the fleece blanket size you want, a pram blanket measures 100 by 75cm or a larger cot blanket measures 150 by 100cm all sizes are measured approximate. Easy to machine wash and fast to air dry or can be tumble dried on low. Made in the UK. We will professionally embroider a name or little message on this polar fleece for example Emily 25.05.08. Just fill in your required text and choose the thread colour, please check spelling. At Amys Gifts we do all our own embroidery made to order, please allow at least 3 days for dispatch. A unique and special keepsake gift for baby. Size: Pram Blanket 75x100cm OR Cot Blanket 150x100cm approx.